When Houdini let it be known he was interested in becoming a cinema star, he was courted by filmmakers both aspiring and established. In 1915 he met with Universal about playing Captain Nemo in an adaptation of Jules Verne's 20,000 Leagues Under the Sea. But negotiations broke down. "I'm afraid I want too much money," said Houdini. In 1917 Houdini's salary demands were met by the Williamson Brothers Submarine Film Company, who specialized in underwater photography and had been contracted for the aborted 20,000 Leagues project. It was reported that Houdini would be paid "the largest sum of money ever paid to any one performer for a single motion picture." The Williamson Brothers announced their Houdini project -- along with the hiring of writer Arthur Somers Roche -- in a full page ad in The Moving Picture World on May 5, 1917. 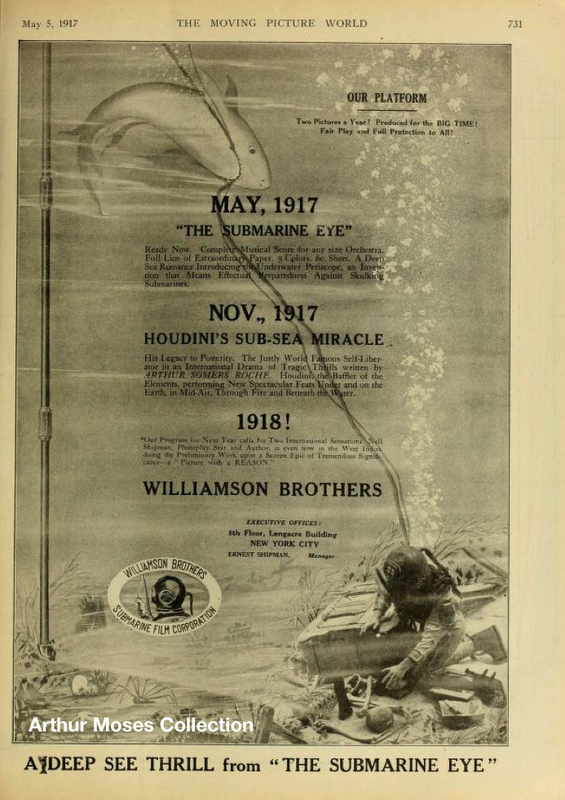 "Houdini's Sub-Sea Miracle" would be released in November 1917 as the Williamson Brothers second film of that year. The idea this time was to produce an "Epic of the Elements" featuring daredevil escapes underwater, on land, and in the air. The underwater escape would be from a steel-chambered bathysphere. Houdini would free himself without letting any water inside. Shooting was planned for the Bahamas. 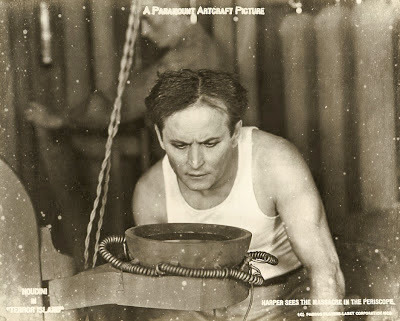 "Through the aid of the Williamson's devices for submarine photography, I will be able to release myself in full view of the camera," Houdini told the movie press. "There can be no doubt whatsoever henceforth as to the authenticity of my performance." However, the ambitious project did not make it off the page, possibly because of America's entry into World War I at the very time the film was scheduled to shoot. Houdini later sued the company for back salary. Houdini would instead make his film debut a year later on dry land in The Master Mystery for producer B.A. Rolfe and the newly formed Octagon Films, Inc. But Houdini would return to the idea of underwater and submarine action in his 1920 feature for Famous Players-Lasky, Terror Island. Thanks to Arthur Moses for the advert. Background information from The Secret Life of Houdini by William Kalush and Houdini!!! The Career of Ehrich Weiss by Kenneth Silverman. Great Stuff John! I am assuming you have seen the related Moving Picture World article: Houdini for Pictures - Williamson Brothers Secure World Famous Handcuff King for Sole Appearance in Stupendous Motion Picture, dated April 28, 1917 p622. It came out the week before the ad in this blog. If not let me know. No, actually, I've not seen that!